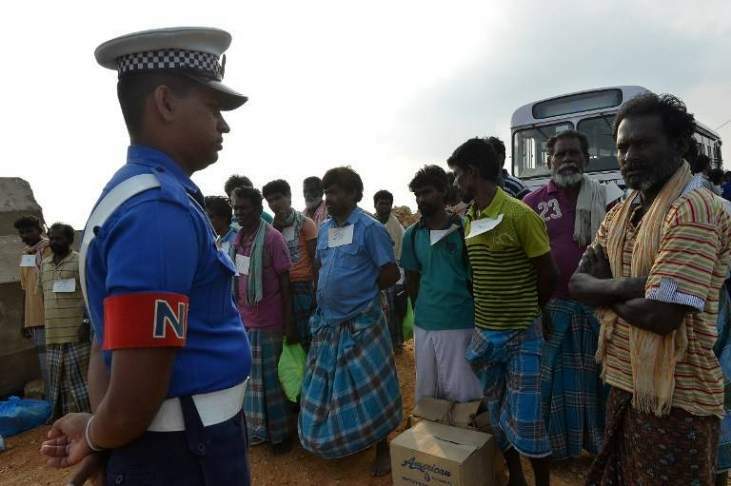 Eight Tamil Nadu fishermen were arrested today by the Sri Lankan Navy for allegedly fishing in the territorial waters of the island country, drawing angry reaction from the state government. Nagapptinam/Chennai: Eight Tamil Nadu fishermen were arrested today by the Sri Lankan Navy for allegedly fishing in the territorial waters of the island country, drawing angry reaction from the state government which termed it as an "abduction". The fishermen from Nagapattinam were fishing near Paruthithurai when they were held by Lankan naval personnel who took them to Kangesanthurai port there. The incident comes two days after four fishermen from Pudukottai district and 17 from Karaikal region in Puducherry were arrested by the Sri Lankan Navy for allegedly fishing near Neduntheevu in the island nation. Tamil Nadu Chief Minister K Palaniswami took up the matter with Prime Minister Narendra Modi and called it "yet another outrageous" incident of "illegal abduction and detention" of Tamil Nadu fishermen. In a letter to Modi today, he noted that late AIADMK leader J Jayalalithaa had also repeatedly brought to the Prime Minister's attention the "travails of innocent Tamil Nadu fishermen "who face harassment, abduction and detention at the hands of the Sri Lankan Navy, which continues in the traditional waters". "Things have come to such a pass that fishermen from Tamil Nadu are unable to access their traditional fishing waters for fear of being abducted or attacked by the Sri Lankan Navy." "The entire fishermen community in Tamil Nadu is agitated by the repeated provocative actions of the Sri Lankan Navy through continued apprehensions," Palaniswami told Modi. Despite the issue having been taken up "repeatedly" by the state government, "we are yet to see an end to the problem of harassment and arrests of innocent fishermen from Tamil Nadu," he said. "These continuing 'illegal abductions' in the high seas had the potential to harm the joint initiatives of the Government of Tamil Nadu and the Government of India to bring about a permanent solution to this sensitive vexatious livelihood issue of our fishermen," the chief minister said. Palaniswami requested Modi to instruct the External Affairs Ministry to register a strong protest with the Sri Lankan authorities about the "continuing abductions" in the Palk Bay and the prolonged detention of the Indian fishermen by the Sri Lankan Navy. He urged Modi to also direct the MEA to take up with Sri Lanka the issue of immediate release of a total of 28 Indian fishermen and 138 fishing boats from its custody, including those apprehended today.